Funeral services for Elliott T. Bowers, 83, 9th president of Sam Houston State University, were held Tuesday (June 3) at First United Methodist Church and Oakwood Cemetery in Huntsville. Bowers, 83, died Friday afternoon (May 30) at Huntsville Memorial Hospital after a long illness. His survivors include Linda and Charles Rushing of Seguin, Cynthia and Paul Kimmel of Goleta, Cal., four grandchildren, two great-grandchildren, and sister-in-law Mrs. Billie Vaughn and her husband, Brink, of Baton Rouge. Frances Handley Bowers, his high school and college sweetheart, preceded him in death. 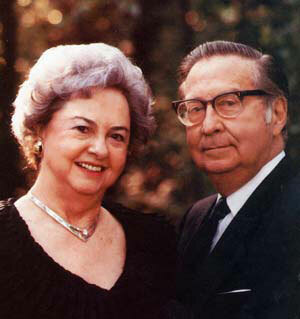 They were married from May 29, 1940 until her death in September 1999. Pallbearers, all of whom were friends and close professional associates, were Ferol Robinson, Lamar Urbanovsky, Ed Sandhop, Jim Franklin, Lee Drain, M. B. Etheredge, Jack Staggs, Doyle Stuckey, Bob Marks and Wayne Rainwater. The family requested that in lieu of usual rembrances donations be made to the Dr. Elliott T. Bowers Honors Program at Sam Houston State University. 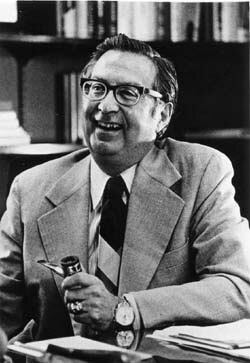 Bowers, who served as acting president twice and then president from 1970 until his retirement in 1989, was an administrative genius when it came to campus construction. A resolution passed by the Texas House of Representatives to honor him at his retirement praised his "revitalization" of the university, which included almost $100 million in new projects and renovations. Major facilities completed under his administration included the Teacher Education Center, Bernard G. Johnson Coliseum, University Theatre Center, Beto Criminal Justice Center, Rather Communications Building, Lee Drain Building and mall, the Health and Physical Education Building, Bearkat Stadium and field house, and the Music Building. Bearkat Stadium was renamed Bowers Stadium in his honor and the street that runs just south of it was named Bowers Boulevard. He was also honored with the title president emeritus when he retired. Bowers was not only a bricks and mortar administrator. When he became president, only 40 percent of the SHSU faculty members held terminal degrees. When he left that percentage had doubled. Academic programs were strengthened in many areas, including education, business, and the arts, and the university's doctoral program in criminal justice was ranked among the top three in the nation. Under his leadership the SHSU student body grew in numbers and quality. When he became president in 1970, fall enrollment stood at 10,025. After he left office in the fall of 1989, the count was 12,359. Admission standards were also increased, including twice within his last seven years as president. Bowers was associated with Sam Houston State for more than half of its almost 125-year history, as a student, faculty member, administrator, president, and president emeritus. He was born Aug. 22, 1919, in Oklahoma City. His family moved to Texas, and he graduated from Mexia High School, where he was an all-state halfback and honor student. During his high school days he was a linotype operator for the Mexia Daily News. He also sold newspapers and newspaper advertising, milked cows, and sold the milk to earn money for college. He was an outstanding musician, touring briefly with the Lawrence Welk band. While studying at Sam Houston State Teachers College, he was also director of music at Huntsville High School. He was a member of the student council at Sam Houston State and was selected for Who's Who. In 1941 he received his bachelor's degree in music, and a year later his master's degree in music. He received his doctorate in education from the University of Houston in 1959. He served in the U. S. Air Force from 1943 to 1946, and returned to Sam Houston State to work as director of testing and guidance, director of the student union, vice president for university affairs and dean of students, becoming interim president for two years in 1962. In addition to serving the university, he was active in many church, civic, professional and community organizations, including First Methodist Church of Huntsville, the Salvation Army, and the American Cancer Society. He served on the board of directors of the Sam Houston Area Council of the Boy Scouts of America, as president of the board of the Wesley Foundation and the Huntsville Chamber of Commerce, and the chamber's Huntsville Leadership Institute advisory board. He was also a member of the Sons of the American Revolution, Masons, Alpha Phi Omega, Kappa Delta Pi, and Phi Mu Alpha. While Bowers had a gift for wit and timing as an ad lib speaker and was a master builder, not all of his tenure as Sam Houston president was upbeat and happy. One of the saddest days was Feb. 12, 1982, when the university's beloved Old Main Building burned. "It's all gone," he said in a news release that day. "The spires, the stained glass windows. The auditorium. All those things that meant so much to anyone who has known Sam Houston." He described the memorable old building as "priceless" and "irreplaceable," words that might also be used to describe his loss to the Sam Houston State University that he loved and served for the past 66 years.